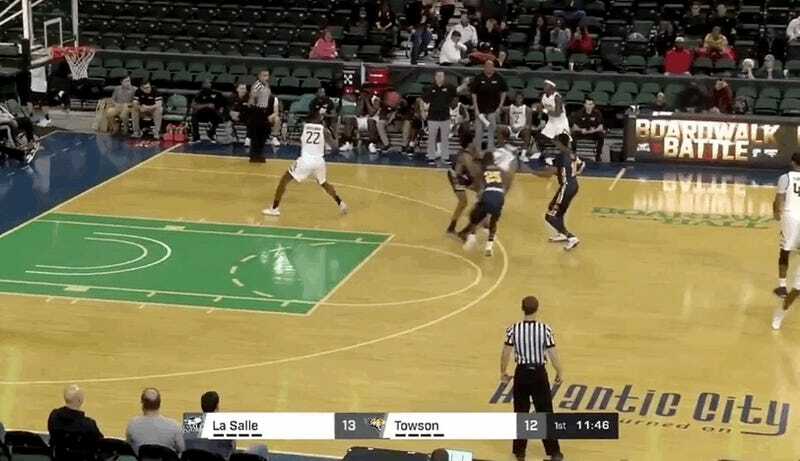 About halfway through the first half of Towson’s game against La Salle on Saturday, freshman forward Solomon Uyaelunmo saw an open lane to the basket, dribbled once and (kind of) dunked the ball with both hands. Unfortunately, the reason the basket in question was so open was because it belonged to the Explorers, not the Tigers. Besides the dunk itself, the best part of that clip is when all five people on the left side of the bench simultaneously put their hands on some part of their faces. As much as this might seem like it was an incredibly avoidable error, I don’t entirely blame Uyaelunmo for what happened. First off, the inbounding guard, Jakigh Dottin, should have probably hustled more to get back onto the court.Had he been a half-second faster, the forward would have had a chance to at least pass out of the shot. Second, if I possessed the athletic ability to dunk on a regulation basketball hoop—which I currently do not—I’d be dunking on every rim in sight. The freshman probably just got excited over the unguarded basket and couldn’t help himself, like any person with his height and hops would.